I had the pleasure of meeting the performer before the show and having quite the nice chat. His love of Theatre, energy and dedication were obvious. I really wanted to love it for his sake, just because he was so earnest. Plus he came all the way from Portugal. He’s British, though. You can guess as to his love of word play from the title, his company name and his description in the program. 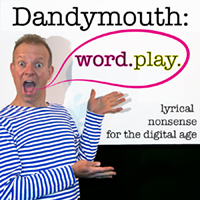 It must be, as promised, spoken word for the 22nd century as I understood little of it. There was a lot going on but nothing happening. The bones of something are in there; and he’s very clever; so I hope he can flesh them out. There were some amusing moments. But, when you are checking the time, that tells you something. A different guest musician will join each show, so each show will be different. We were blessed with an accomplished clarinetist, Amanda, who really added some humour to the show. I really wanted to love it.